In this confusing era in history, we are surrounded by voices that give advice, values, opinions and convictions. With the growth of the internet and multiple sources of media invading our lives every day, we are inundated with countless messages. Never was there so much input and yet, the consequences have produced more confusion, over-commitment, busyness and stress. God intended us to understand how to live our lives as mothers in such a way that wisdom gives us true vision, God’s word lead us into good pathways, and peace rules our days. 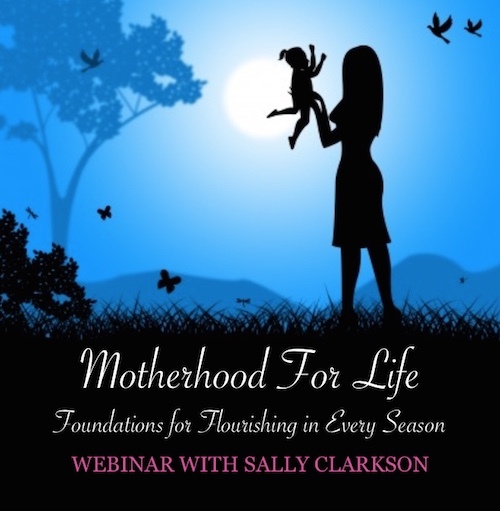 From the early years of marriage and motherhood, to navigating the tumultuous waters of teenaged children, Sally Clarkson has walked through many changing seasons as a Mom. Now, as she reimagines her role as mother to her grown children living out into the world, Sally reflects on what it means to fully live into the calling of motherhood, and how to last for the long haul. From her heart of experience, Sally shares secrets for weathering the storms and thriving as a Mom no matter the circumstances. This webinar is full of genuine stories, practical ideas, and heartfelt advice. In this e-conference, you will breathe a sigh of relief as you embrace the secure ways God has designed us to live. Join Sally as she outlines ways to walk through all the seasons well, to last for the long haul, and to be able to look back and see the faithfulness of God in part of your life. When you purchase this webinar, you will receive a PDF outline for the conference. At the top of the PDF document will be a link and password to the online video content for this e-conference. We hope this webinar blesses you greatly, no matter where you are along the way of your journey!